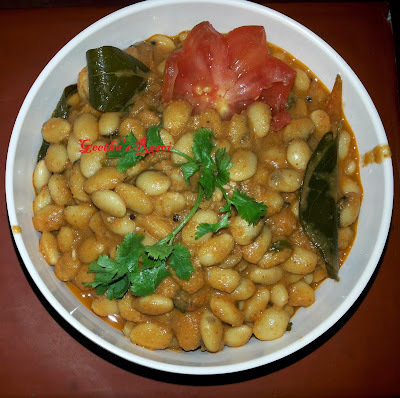 This is a recipe which is generally prepared during fasting days because in this no onion or no garlic is used. The method given here is my mother-in-law’s method. Soak Avaro for 5 to 6 hours and pressure cook. Heat oil in kadai, add mustard seeds, methi, curry leaves, hing powder, chilly powder and coriander powder fry for 5 minutes in a low flame then add chopped tomatoes and cooked Avaro and chopped coriander leaves. Boil it for 10 to 15 minutes. This is a semi dry curry. Goes well with chappathi or rice as side dish.